Barclays bank is closing about 100 UK accounts held by cash transfer businesses, over fears they are being used for money laundering. The businesses are vital for Somali expatriates sending remittances back home, where banking facilities have collapsed. 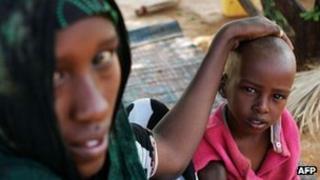 Aid workers say the service is a "lifeline" for 40% of the Somali population, who rely on the transfers. It is feared that the cash transfer business could now go underground. Money transfer shops are a lifeline for millions of people in the developing world. Their relatives living in richer countries send cash for school fees, medical care and even basic food. The companies having their Barclays accounts in the UK closed have branches in countries as diverse as Bangladesh, South Africa and Romania. Barclays says some of the companies don't have checks in place to stop cash reaching money launderers or terrorists. Worldwide, the remittance business is estimated to be worth $350bn a year. That's more than the annual value of the entire economy of Denmark - and more than double the total of international development aid. The long war in Somalia means there is no formal banking sector at all, so millions of Somalis depend on money sent from abroad. Several money transfer businesses - including Dahabshiil, the largest such business providing services to Somalia - say Barclays has given them a temporary reprieve of one month. Dahabshiil says it is urgently trying to meet the bank's criteria to keep its account open. Abdirashid Duale, chief executive officer of Dahabshiil, has said Barclays' decision could see money transfers pushed underground into the hands of "unregulated and illegal providers". Barclays is the last major UK bank that still provides such money transfer services to Somalia, which has an estimated 1.5 million of its nationals living overseas. The UK Serious Organised Crime Agency has identified money service businesses generally as a potential money laundering risk. All international banks have been tightening rules in a bid to cut money-laundering and funding of groups accused of terrorism. "Some money service businesses don't have the proper checks in place to spot criminal activity and could therefore unwittingly be facilitating money-laundering and terrorist financing," Barclays said in a statement last month. The bank emphasised that it was "very happy" to serve companies with strong anti-financial crime controls. Last month, more than 100 researchers and aid workers signed a letter urging the UK government to stop Barclays closing its account with Dahabshiil. They said the move would cause a crisis for the families that rely on the transfers. According to Dominic Thorncroft of the UK Money Transmitters Association (UKMTA) trade body, "closing these accounts will lead to a humanitarian crisis in Somalia". UKMTA represents over a third of money transfer firms in the UK. Oxfam says there is no need for a blanket shut-down of these kinds of accounts. Instead, it would like to see better regulation and the money service businesses investigated on a case-by-case basis. Research for the charity suggests that Somali migrants in the UK may be sending as much as £100 million a year back to Somalia, about 12.5% of the total amount. That would make it the second largest proportion of remittances, after the US. Oxfam's study also estimates that remittances could account for about 60% of a recipient's annual income.